Portfolio Management - Meaning, Importance & Process | Veristrat Inc. Portfolio Management is the process of developing an investment strategy and asset allocation to meet investors objectives and minimizing risk to achieve superior returns. Investors, portfolio managers and analysts should analyze the risk return trade-off of the portfolio as a whole, not the risk return trade-off of the individual investments in the portfolio. As, the unsystematic risk can be diversified away by combining the investments into a portfolio. The portfolio managers should only be concerned with the systematic risk that remains in the portfolio. 1 Planning – involves identifying investors’ objectives & constraints, developing an investment policy statement, forming capital market expectations and determining the strategic asset allocation. IPS is a formal document that governs investment decisions making, taking into account objectives and constraints of investors. The IPS promotes long term discipline for portfolio decisions and protects against short term shifts in strategy with changing market conditions. The key elements of IPS are client description, objectives & constraints, purpose of the IPS with respect to policies, objectives, goals & restrictions, asset allocation ranges and guidelines for portfolio re-balancing. This is the last step in planning stage of portfolio management. The capital market expectations are taken into account to assign weights to asset classes in the investment portfolio. Tactical asset allocation is a dynamic investment strategy that shifts asset allocation to take advantage of market inefficiencies. Active Investment – is reactive to alteration in market expectations. Example: Investing in accordance with a specific style. Passive Investment – is not reactive to any alteration in market expectations. Example: Buy & hold. Hybrids – contains enhanced index, risk-controlled active and semi-active strategies which are mixture of active and passive strategies. Example: Index tilting, where the portfolio manager wants to track a benchmark portfolio, but at the same time diverges from the same benchmark portfolio allocations to gain higher returns. Portfolio selection – predictions of the capital markets are connected to the selected investment allocation strategy to estimate assets for the investors’ portfolio. Often, the portfolio optimization technique is employed to determine the portfolio composition. 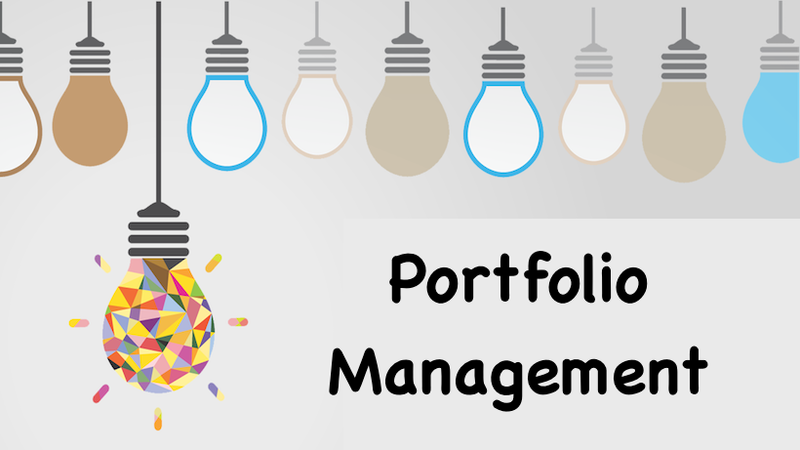 Portfolio implementation – after the portfolio selection, the portfolio is implemented. Huge transaction costs can adversely impact the performance of the portfolio while implementation. Monitoring and re-balancing – portfolio manager is required to monitor the portfolio due to changing investor needs & circumstances, economic fundamentals and capital market conditions. Portfolio re-balancing involves realigning weights of assets and adjusting accordingly to the current strategic asset allocation. Transaction costs and taxes are to be considered while re-balancing. Performance evaluation – investment performance of the portfolio should be assessed on a regular basis to quantify the accomplishment of objectives and ability of the portfolio manager. Both absolute returns and relative returns can be utilized for assessment of the portfolio. It acts as a feedback and control mechanism. Desired return – the amount of return the investor expects to achieve from portfolio. Required return – the minimum level of return that the portfolio must achieve. Risk objectives is based on both investors’ willingness and ability to take risk. Willingness depends on psychology and personality of investor. Ability depends on time horizon of investment and objectives of investor. Liquidity constraints – identifies investors spending requirements including payment for home, education, retirement and health. Some assets of the portfolio should be quickly converted to cash to meet the liquidity concerns of investor when required. Higher liquidity requirements commonly indicate a lower tolerance for taking risk. Time horizon constraints – states the time period in which the portfolio is expected to generate returns to meet specific future needs of investor. Unique circumstances – are internally generated and represent social concerns of the investor. An investor may not invest in specific stocks due to ethical objections. University endowments and philanthropic organizations may restrict investments in companies selling tobacco or alcohol. Tax constraints – investment choices must be made depending on how portfolio returns are taxed. Some institutional investors like the pension funds have tax exempt status. The investment income and capital gains are taxed differently. Legal & Regulatory – are externally generated constraints that mainly effect institutional investors. Example, the pension funds are subject to limitations on their portfolio composition. The portfolio management is an ongoing and dynamic process according to changing circumstances and needs of the investor. The portfolio manager should achieve safety of investment, consistency of returns, capital growth, marketability, diversification and favorable tax status for the investor. The portfolio of assets should be managed with the best investment decisions to benefit the investor. The portfolio should achieve the investors’ objectives taking into account the constraints.